Fraser Nelson's interesting article for the Spectator here provided a novel presentation of UK employment levels, comparing changes by Prime Minister under the headline Cameron the job-maker. I looked at the impact of arrivals from abroad on these numbers for Blair, Brown and Cameron here on both levels and rates of employment. Just to put a downer on all of the above, I’ll say what the government tends not to emphasise. The toleration of above-average inflation has crushed the real value of wages and it’ll likely be 2020 before the average salary is back to where it was in 2007. 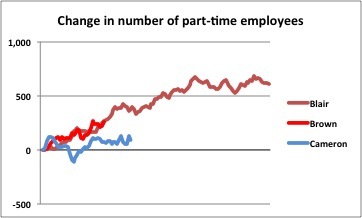 Companies are hiring more people, because people are cheaper (and more likely to work part-time nowadays or on flexible (aka ‘zero hours’ contracts). Cameron’s jobs recovery is a bittersweet success. But a success nonetheless. 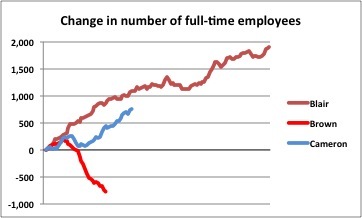 As I pointed out too (and Fraser realises of course), these data do not distinguish one job from another, and so do not bring out the extent to which the relative proportions of full-time and part-time work have changed, or proportions of employee and self-employed. So presented below simply to illustrate something of this, pictures using series from the ONS on the same seasonally-adjusted basis as Fraser's MGRZ. Firstly the change in numbers of full-time employees in thousands. 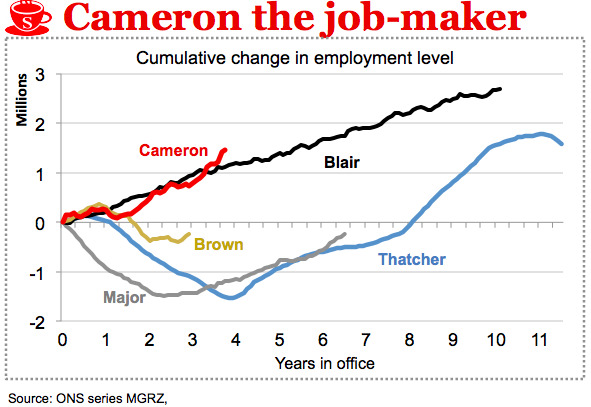 Clearly this is a very different picture from a presentation of change in numbers of total people in employment, and shows Cameron still behind Blair in creation of full-time 'pay packet' jobs. The next three pictures are to a different scale from the one above, but all share the same scale for ease of comparison, numbers in thousands again. This one shows that Blair employment growth comprised a large amount of part-time employment, about a third of total growth by number. In contrast, the numbers under Cameron are barely significant. 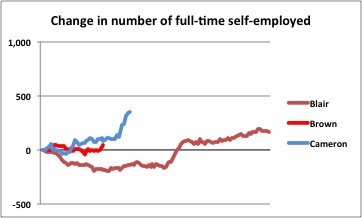 In contrast, and as much reported and puzzled over, here is the recent upsurge in full-time self-employment under Cameron. What's interesting is that the pace and magnitude of the most recent change is not unprecedented, but previous change on this scale was not sustained. Time will tell, but forecasters might do well to be cautious before calling a structural change. 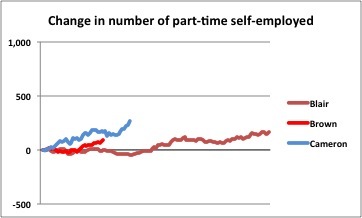 Increases in part-time self-employment are greater and sharper than previously - and now over quarter of million - contributing a much more significant component of overall change. If you're interested in growth in self-employment, follow links for illustrations of data and thoughts on ageing and the UK's open labour market as drivers.